 Closed magnetic circuit core,very low radiation noise by magnetically shielded construction.  The iron power toroid core is low permeability, the material has low core loss and good DC saturation characteristics. Thoptimal design realizes middle -high quality sound and low distortion.  Super high DC saturation allowable current and temperature rise allowable current. 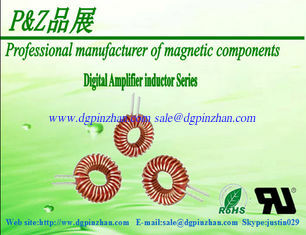  Suitable as choke for digital amp. Car audio,LED TV, 5.1ch Home theater, etc.